Aluzinc - Galvanised - Stainless - Corten (Weathering Steel). Aluzinc steel has gone through a protective chemical process and has a zinc coating that prolongs the life of the steel to avoid corrosion for a long time. Galvanised steel has gone through a protective chemical process that prolongs the life of the steel to avoid corrosion for a long time. We can custom make any size you require and are happy to quote for you. Stainless steel, a beautiful material that is available in polished or brushed finishes. Corten steel, also known as 'Weathering Steel' is widely used to clad buildings and has been used for famous structures like the Angel of the North. It is a steel alloy containing copper as well as chromium and nickel and oxidises giving a rusty appearance. Staining can occur from the corrosion so best to sink into a patio area or place on gravel. These planters also need good drainage to prevent continual corrosion which might lead to irreparable damage. 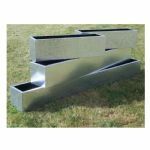 Our steel planters are made to order so please allow up to 3-4 weeks for delivery. A further 3 weeks is required to weather the steel after delivery, this weathering can be accelerated on site by spraying with water. NB: Corten steel can cause stains to clothes and patios.